The Moritz Brewery in Olomouc was named after a prominent citizen of the 19th century. It opened in 2006 as an honest pub with good beer, food, great atmosphere and a pleasant garden in the city center. 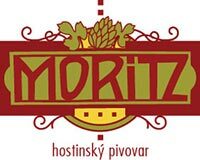 Moritz beer is produced using classic Czech beer technology, dual mash, thrice hopped, and fermented in open vats. It’s aged in air-cooled lager tanks from which it is sent to the taps without filtration or pasteurization. Haná malt and hops create a delicious, high-quality, highly drinkable beer. Beers permanently on tap: Moritz 11° – classic light lager, Maisel 11° – four-malt semi-dark beer, Moritz 12° – cold-hopped bitter beer. Occasionally production of Černá Tereza (black) and Zázvorová 12° (ginger). In Olomouc, Moritz can be purchased in 1.5-liter PET bottles and in barrels. Draft: Bounty Rock Cafe, U Kuděje, Temle. Uničov: U Bílého beránka, Loštice: U Lišky Bystroušky. Tours are possible by mutual agreement. The summer garden hosts concerts during the summer.